Amanda Berry of LANL’s Bioenergy and Biome Sciences group is the lead author of the study. While species of algae may appear the same under a microscope, different types or strains of the species can exhibit different traits and even have different DNA. 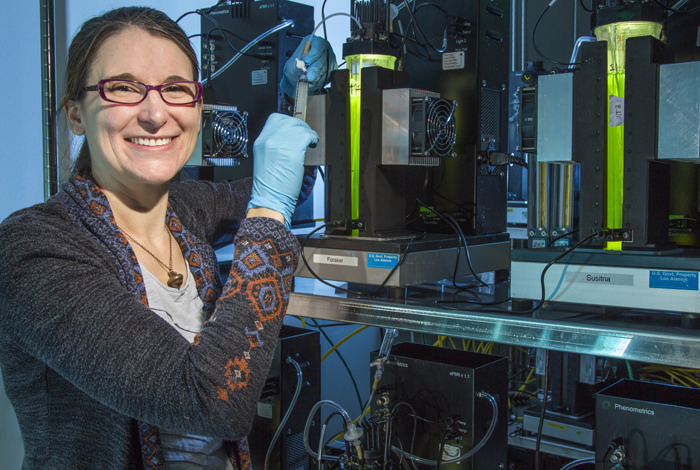 In a recent paper, scientists at Los Alamos National Laboratory (LANL) describe strains found in a single culture of green algae that is being researched as a candidate for biofuel production. Scientists from LANL and the New Mexico Consortium are exploring this algae strain and developing genetic engineering tools that would allow algae to grow faster and accumulate more biomass for biofuel production. This project is funded by the U.S. Department of Energy’s Bioenergy Technologies Office Advanced Algal Systems. Read more about this fascinating research project on the BETO technical blog web page.